My wedding is in 29 days and I have yet to come up with ideas as to how to decorate my reception. We are having both the ceremony and reception at my mother-in-law’s church. The reception is in their "hall" which is actually a basketball court with a stage and kitchen (which our caterer will use). HOW DO I DECORATE A BASKETBALL COURT!? I want the reception to tie in with the rest of the wedding, which is elegant and classic. So far we have candles, candle holders and marbles to go in the candle holders. That is it as far as decorating goes. How can I turn this basketball court into an elegant wedding reception? Basically, you want to draw the eye away from the basketball court. To do this, you have to create other focal points. My first suggestion would be to use a tent. However this would depend on your budget. 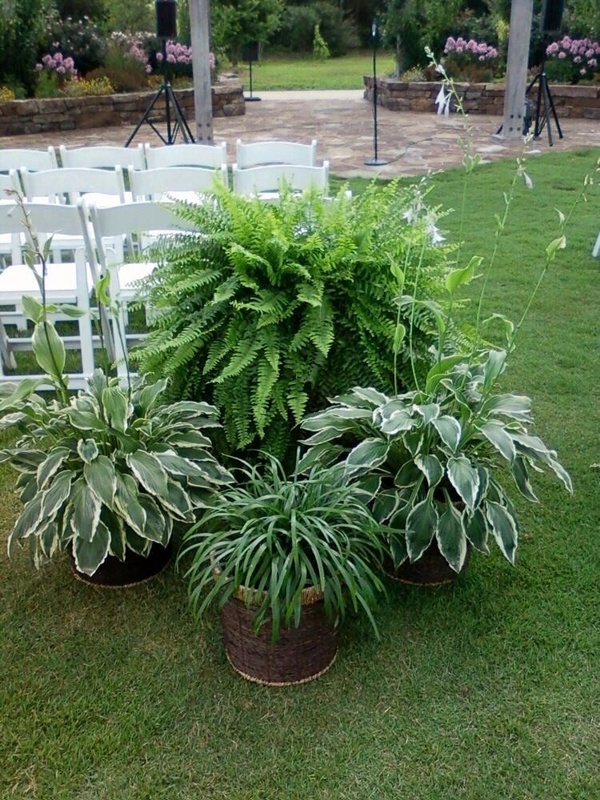 Use ferns, hosta, liriope, and shrubs. These can often be rented from a garden center. You'll need decorative containers to hide the grower's pots as well. Here's a photo of one such grouping we created. This was for an outdoor wedding, but you could easily move it indoors. Ask the Experts is your chance to have your wedding questions answered by a panel of experts. If you have a question write asktheexperts@onewed.com.